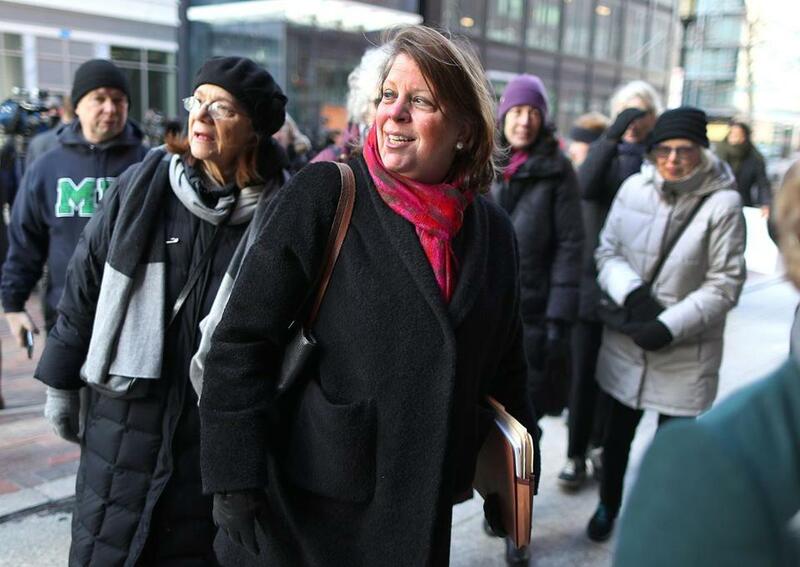 ACLU of Massachusetts Executive Director Carol Rose entered Moakley Federal Court on Feb. 3, 2017 for a hearing on the organization’s lawsuit challenging Trump&apos;s executive order on immigration. The ACLU of Massachusetts is suing US Immigration and Customs Enforcement to force the agency to release information regarding “immigration updates” that one of its top officials gave to a law enforcement association in February, according to the group. ICE’s Acting Deputy Director Matthew Albence addressed the annual winter conference of the National Sheriffs’ Association on Feb. 10 in Washington, D.C., according to the suit. The ACLU of Massachusetts filed the suit in federal court Wednesday, seeking an order that would prompt ICE to produce the requested records and award the group costs and reasonable attorney fees. The suit was filed on the same day that acting ICE director Ronald Vitiello said he was quitting the agency, an announcement that came after President Trump told reporters last week that he was pulling Vitiello’s nomination for the director’s job, saying he wanted to go in a “different direction” with someone “tougher.” In a letter, Vitiello told employees that his last day at ICE was Friday. Vitiello’s departure follows Homeland Security Secretary Kirstjen Nielsen resigning Sunday after a meeting with Trump. The announcement of the resignation of Claire Grady, acting homeland security deputy secretary, followed Tuesday. ICE is an organization within the US Department of Homeland Security. As acting deputy director, Albence is ICE’s second-in-command. Albence “executes oversight of ICE’s day-to-day operations,” according to the agency’s website. In its suit, the ACLU said it requested the records from ICE on Feb. 22. On March 15, ICE sent an e-mail invoking a 10-day extension to respond to the request, and the agency has not provided any other response nor has it produced the requested records, according to the lawsuit. The group says that seeking the records is “an important component of the ACLU’s ongoing work to protect and defend immigrants, and to understand the relationship between ICE” and Massachusetts law enforcement entities. Material from The New York Times, Associated Press, and Bloomberg was used in this report. Danny McDonald can be reached at daniel.mcdonald@globe.com. Follow him on Twitter @Danny__McDonald.